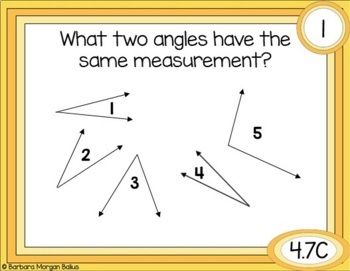 This is the first in a series of Math Test Prep materials for fourth grade. Included are twenty task cards. These task cards may be used for a quick check of mastery of the standards as well as for practice. 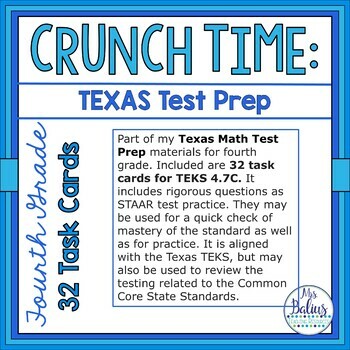 This bundle contains all of the CRUNCH TIME: Five Week STAAR Review Resources for fourth grade math. This is a Five Week Outline for Fourth Grade Math STAAR Test Prep. 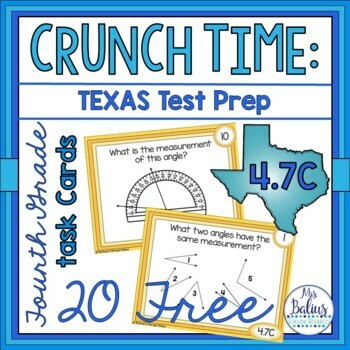 Watch for more fourth grade test prep material aligned with the TEKS and the CCSC to come! •	This material is copyrighted by Barbara Morgan Balius. The purchase of this copyrighted product includes a limited license for your classroom use. 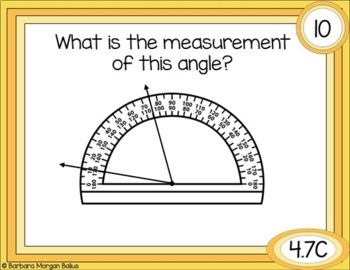 It is meant for use by one teacher in one classroom. You may use this resource for each of your students in one classroom. The product may not be copied and distributed, uploaded to the internet, or stored in a public retrieval system outside of the scope of your classroom before obtaining written approval from its author, Barbara Morgan Balius. This resource is not an Open Education Resource (OER) and as such cannot be uploaded to any #GoOpen websites, including, but not limited to, Amazon Inspire. If you intend to use it for more than one classroom, a whole school, or a whole district, additional licenses may be purchased on Teachers pay Teachers in my store. The pages included in this resources may not be used in whole or in part to create something new, and/or be distributed in any way without written consent from the author, Barbara Morgan Balius. If you have any questions pertaining to this limited license for this product, please contact mrsbaliusfirstgrade@aol.com for a quote.